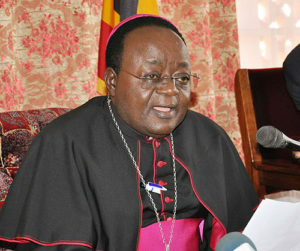 Cyprian Kizito Lwanga says the Lent season is a time of grace for intensive prayer. File photo. KAMPALA–As Uganda joins the rest of the world to mark Ash Wednesday, Kampala Archbishop Cypian Kizito Lwanga has urged Ugandans to review their lives. Archbishop Lwanga said the Lent season is a time of grace for intensive prayer, almsgiving and fasting in order to turn our thoughts and actions to God as our Father and Creator. Ash Wednesday is the day that marks the beginning of 40 days of fasting for Christians. The day represents the 40 days Jesus spent fasting in the wilderness. This year’s Lent season is being marked under the theme: ‘Remember, Rejoice and Renew’. Quoting the Bible, Lwanga said Moses stayed on Mount Sinai for 40 days to receive the Law of the Covenant (Exodus 34:28). “Our Lord fasted for 40 days in the desert before He started his mission. During Lent, we Christians prepare ourselves to celebrate the paschal mystery of our Lord’s death and resurrection by a penitential season of 40 days called the Lenten season,” he noted. According to Lwanga, Lent season is aimed at preparing Christians for the celebration of the death and Resurrection of Christ. “The better the preparation the more effective the Easter celebration will be. One can effectively relive the mystery only with purified mind and heart,” the Archbishop said. He also explained that the purpose of Lent period is to provide purification by weaning men and women from sin and selfishness, through self-denial and prayer. Each year, on the occasion of Lent, the Church invites us to a sincere review of our life in light of the teachings of the Gospel, hence Lent is a time of grace for intensive prayer, almsgiving and fasting in order to turn our thoughts and actions to God as our Father and Creator. A. REMEMBER what the Lenten season is all about. According to Biblical tradition, Moses stayed on Mount Sinai for forty days to receive the Law of the Covenant (Exodus 34:28). Our Lord fasted for forty days in the desert before He started his mission. During lent we Christians prepare ourselves to celebrate the paschal mystery of our Lord’s death and resurrection by a penitential season of forty days called the Lenten season. So the real aim of Lent is, above all else, to prepare ourselves for the celebration of the death and Resurrection of Christ…The better the preparation the more effective the Easter celebration will be. One can effectively relive the mystery only with purified mind and heart. The purpose of Lent is, therefore, to provide that purification by weaning men and women from sin and selfishness through self-denial and prayer, by creating in us the desire to do God’s will and to make God’s kingdom come by making it come first of all in our hearts.